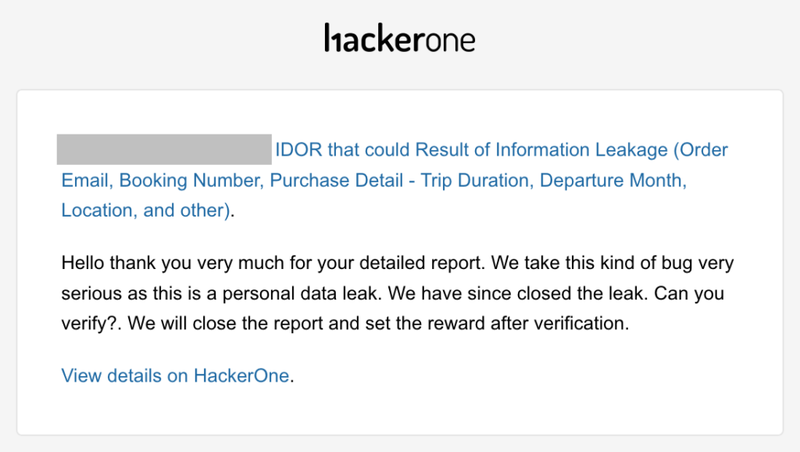 In short, after few hours of testing, finally I found 2 subdomain takeover issue and one of the good one is finally found an IDOR that could result of Personal Data Leak. And yes, the detailed about IDOR could be seen at this simple report. Just like a common site that has an online shopping feature for their customer, this private program also provides the various payment method that could be choose by customer to pay their bill. To be honest, since its already around 3 months from the issue has been closed, then we didn’t remember exactly the list of payment choice except accepted the various international credit card. When we learn how the application works, the flow to pay the bill itself need several steps to be conduct by the customer before the payment was proceed into the 3rd party service. Here are the general flows that we learn. 2.1.1. User should choose the destination that they would like to choose. After the choice is decided and submitted, then the application will generate the temporary URL that saving our session that contains our choice (its normal and common at the shopping application) and send the POST Request that contains our personal data (that saved at our profile). 2.1.2. In this part, the user should fill the personal detail including choosing the payment method. When the payment detail has been submitted, then the application will changes the URL from “save_session” into “order” request. 2.1.3. 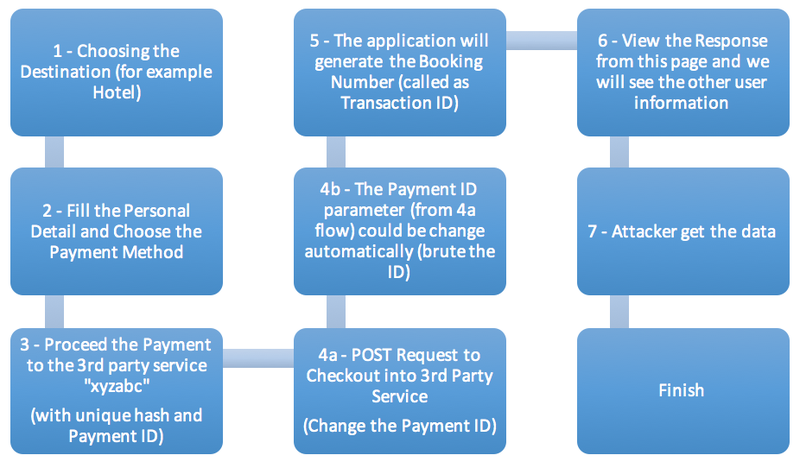 When the POST request has check correctly by the server (in other words, there is no needed data anymore), then the application will automatically send the request to the function (including the unique hash and payment numbers) that proceed the payment to communicate with the 3rd party service (we guess it because the name of the function is very similar with the company that provides this kind of service). To censored the name, then we will name it “xyzabc”. 2.1.4. After the unique hash and payment numbers are generated at the URL, then the application send this request to the POST Method to checkout the payment process to the 3rd party service. Here are a sample requests that sent by the application. 2.1.5. It doesn’t matter if the detail is correct or not, the application will automatically generate the booking number. In this case, if the payment was failed, then the booking number (transaction ID) will contain the failed payment process information at the page. After few analysis, then we found out if there is a problem at the point 2.1.4, which is when the application was try to proceed the payment by send the “payment_id” parameter to the server. In other words, by manipulating this parameter, then we could enumerate the success or failed booking that made by the other user. This kind of vulnerability could allow the Attacker to gain the access into some purposes without the need to has a valid authorization. Basically, this execution is conduct by manipulate a value of the parameter that exist at the application. In its “implementation”, the purposes of this execution are to see or changing the (sensitive) information that just could be access by the user that has a valid authorization into that information. 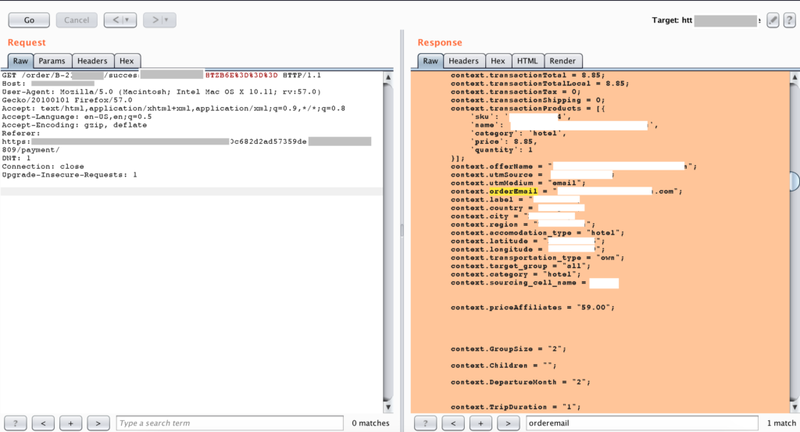 In this situation, the problem related IDOR appears at the “payment_id” parameter because the application didn’t validate the session yet in the checkout request. As described above, the site didn’t validate the session yet in the “payment_id” request. This vulnerability could allow the Attacker to get the failed or succeed booking that created by other user at this site without the knowledge of their account and password. As an information, the best part of this issue is we could enumerate those data automatically by brute forcing the “payment_id” value. Previously, I try to enumerate directly the Booking Number (Transaction ID that explained at point 2.1.5) since the number looks so easy to be guessed. But the result of this is activity is failed (doesn’t show anything even at the browser or by viewing the frond-end source). But, the good result has appeared when we try to change the “payment_id” parameter. By changing this parameter, then automatically the system will generate the other user’s booking number that could be used to enumerate the data that has the relation with those booking number. But please kindly note, this data can’t be seen without viewing the source. For clearing the explanation, here is the simple step that should be conduct: For example, if we change into another ID (at this case, we change from 4055809 to 4055311), we will get redirected into another user Booking Number (B-213xxxxx). At this part, we will get the information that someone with cencored@cencored.com as their email address was ordered the Hotel with 1 day trip duration. We also could get the other information such as total transaction, departure month, group size, location, and other. And yes, one of the best part, we also could enumerate this data automatically. 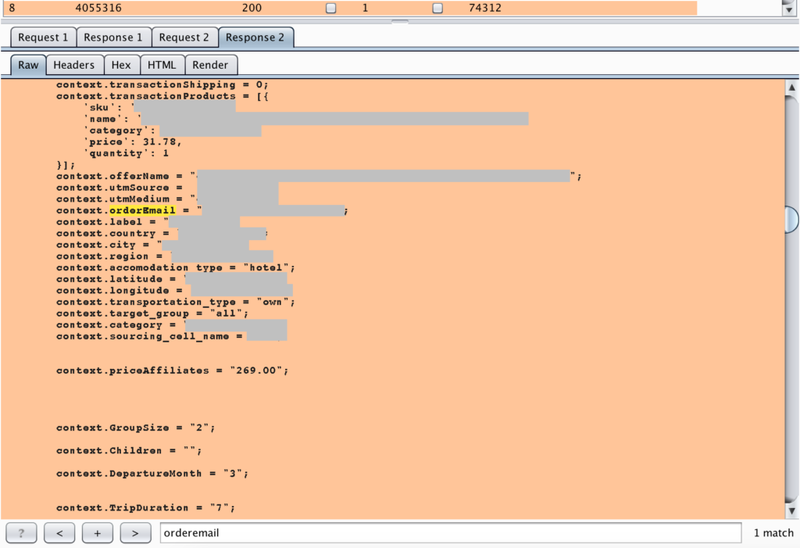 By using the intruder mode and setting the redirect to always, then we could enumerate all of other user’s data. Around Four hours after they received the report (probably read the report), they fixed the issue completely and send the reward around 50 minutes after the fix has been verified. To be honest, this one really break the records that I ever met.